Hi Crafters! Thanks for joining us this week - the theme we have chosen this week is a festive one! We would like to see your 'Snowmen' or women if you want to be politically correct! The Design Team have been busy and have some examples for you below, but first things first we have the results of last week's prize draw! Congratulations to Claire - Claire's Crafty Corner on being drawn for the fantastic prize of the stamps from Crafty Individuals. Please EMail your details to mytimetocraftchallenge@hotmail.co.uk and we will get your prize to you. Please note that it may be a couple of weeks because the team member in charge of this is currently away. Now onto this weeks example cards! 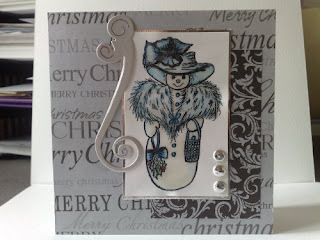 For my card I stamped my Snowman and coloured him with Pro Markers. I matted the image onto gold mirri card and placed this onto embossed card. 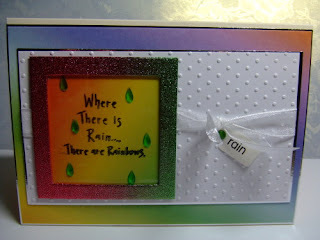 I added a ribbon, sentiment and decorative corners. I stamped Linda Luckin's scenery stamp in dark walnut Marvey heritage ink. Then on some Acetate I stamped Linda' snowman in black Stazon - he was then coloured in with dazzling diamond glitter and turquoise glitter. I then stamped the snowman onto the card with the brown ink pad and cut and stuck the glittered snowman. Dazzling diamonds were then added as snow to the background. I covered a six inch square card with co-ordinating papers. I stamped the snow lady in black and water coloured it, then applied clear gloss over the top. I cut around the image and mounted onto silver card, attached three faux brads and placed on the base card. I die cut a swirl in silver, highlighted it in blue and attached this to the card as a finishing touch. I stamped my Snuggle Up Snowman stamp by Lindsay Mason twice, water coloured them and cut them out. 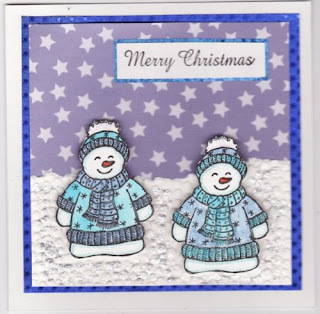 I embossed some white card with a Cuttlebug embossing folder for the snow and used some star paper for the sky, mounting the snowmen to the card with 3D foam pads. Finally I stamped a message and mounted the whole thing on some blue foiled paper and added glitter glue for that sparkly look. For my card I have added some Anita's Classic Christmas paper to a six inch square card. 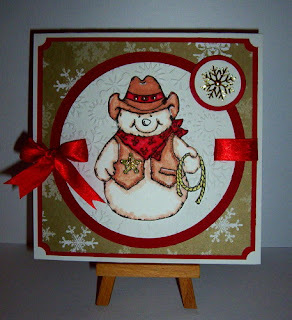 I cut two circles out in red and white card and embossed the white card with the Cuttlebug Snowflake embossing folder. I thread some red satin ribbon through the circles and around the back of the layers, tying in a bow at the side. 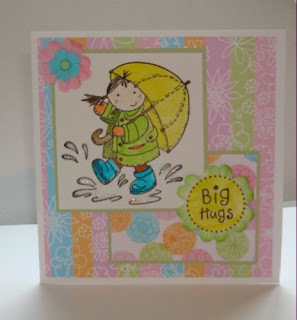 My stamped image is one from High Hopes and I have coloured him with water colours mounting with 3D foam pads. Embellished with some brads and a gold peel-off snowflake. Our designers have made some wonderful examples for you below. Congratulations to Jenny, Heidi, annie2006, * Shaz *, gailscraftyplace, joey, Macpurp, nessy, Denise and Wendi you have won last week's prize: 10% off at Handy Hippo. Please email us at mytimetocraftchallenge@hotmail.co.uk and we will get your prizes sorted out. 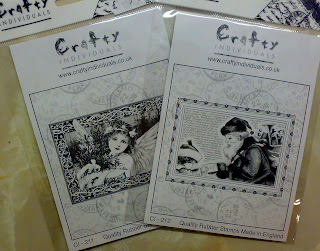 This week's Prize, supplied by Crafty Individuals are these 2 beautiful Christmas stamps, everyone who takes part in this week's challenge by ( 10pm Monday the 10th of November GMT) will be entered into a prize draw and 1 lucky persons name will be selected at random winning these stamps Good luck, we will announce the winner next week. I stamped Milo and coloured him and his dog with Pro Markers. I used K & Co background paper and ATD paw print paper and the 'friend' sentiment was made using Papermania alphabet stickers. I coloured the flowers with Pro Markers to make them match the colour scheme. 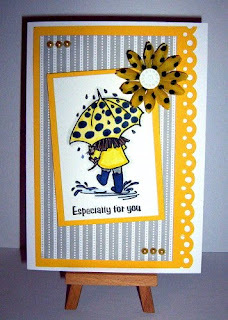 I started this card by stamping the coffee background onto cream card then punched the edge with a stampin' up punch. 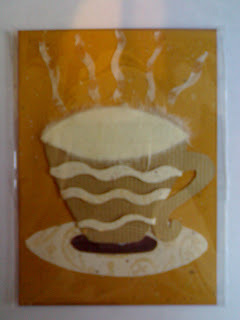 The I stamped various coffee images onto cream card and vellum. The slide mount was coloured silver with a krylon pen. some brown paper was then embossed with a cuttlebug folder and was used in the background. Some silver metal embellisments were used threaded with brown spotted ribbon. Finally a silver heat embossed spoon was added. Using a template, I cut out the cup shape in shades of browns & creams, for the froth I used mulberry paper which I feathered at the edge. I assembled the layers, then attached to a brown base. 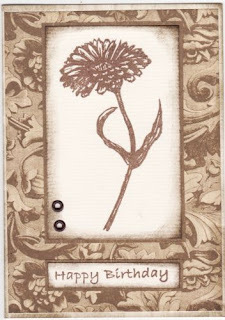 I stamped a Linda Luckin Calendula image in Vintage Sepia Versafine, and inked the edges with Walnut Distress Ink. I matted the image onto some plain and patterned HOTP papers, and inked the edge of a cream cream card also with Walnut. I stamped a greeting and added 2 eyelets to finish. I have had this lovely free image from the *Lisa Vollrath Two Ten *site for some time now - so I decided to have a play with it. 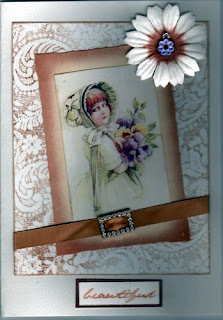 The lace background piece has been made using the *Stampin Up 'Antique lace'* background stamp. I stamped it using ink in a coffee colour and I also added Peanut Butter and Guilded Ivory embossing powders in places for depth and t exture. Embellished with a paper flower, a length of ribbon and a buckle I had lying around.